What makes for effective social media varies between each industry while being influenced by what your selling and your objectives. This means the only underlying characteristics of an effective social strategy is that it be agile, leverage consumer tastes and take advantage of the algorithms social platforms use to decide post visibility. So in this post, we’re going to look at these aspects of social media in the context of the food industry. By the end of the post, you’ll know why it’s critical to differentiate this type of business from others. As well as basic steps needed to better leverage social media to your business’s benefit right now. 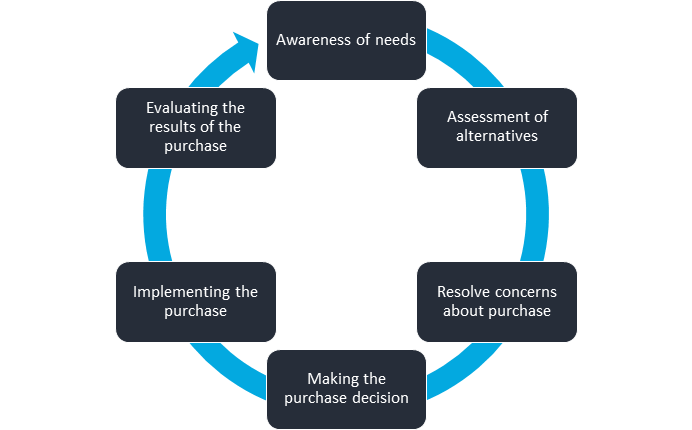 Identifying the customer’s buying cycle is often overlooked by social media marketers. But understanding your target audience’s buying cycle is the first step in creating an effective social media presence. For example, if your selling cars, repetitively encouraging people to buy is not going to result in good engagement. This is because this industry has extended buying cycles that can last years. So attempting to sell a car to every fan every day is going to result in poor engagement. On the other hand, food is consumed multiple times each day. Indeed, one trend in the retail food sector at the moment is the growth of daily grocery shopping and eating out. This creates a growing opportunity to reach fans and persuade them to buy your product in a small window of time. In other words, we are able to complete the cycle below in a matter of days or hours rather than the weeks experienced in many industries. But food products can easily be substituted for an alternative whether that’s another cuisine or product of the same type. So the priority for food business is to increase consumption of their product. An example of this is milk, the priority for those selling it isn’t to educate people on the merits of buying it’s to get them to consume more of their product and not a competitor’s equivalent or a substitute product like Almond or Soy milk. Reduce the length of the buying cycle, that is to compress the time between purchasing again. Prevent or mitigate product substitution. In other words, social media efforts should be focused on educating customers on your product and retaining customers. The selling aspect of social media is still important buts it’s only 1 aspect. Too much selling and not enough education and value to fans will result in existing and future customers switching off, seeing your social media page as an advertising platform rather than a page of value. You should work on all 3 priorities but decide which of the following tactics best fits your product and inform your posting by it to place the greatest emphasis on which priority is most compatible. If you’re selling a household staple like eggs, then you can assume that customers need your product. So the previous example of milk applies where you want to capture more of the market for your product and limit substitution of your own. But what if you’re selling a product with no demand? like goose eggs or a new type of potato, customers have no knowledge or interest in them, therefore no demand exists. So your social media strategy should be focused on educating customers on your product type, not just your specific brand as the more people that know about the product, the more sales will increase. This is why industry groups often run marketing campaigns for their product type, it’s very prevalent in the dairy and fruit industries for example. So when considering what to post, ask yourself are you selling in a mature market where you want to capture a portion of it at the expense of a competitor’s share; or are you selling to a fledgling market where you have to first create demand for your product. Ever wondered why so much of food packaging features a recipe? To increase consumption and thus the buying frequency. The perfect example of this is breakfast cereals. By their very nature breakfast cereals are normally consumed once a day. By encouraging people to make recipes like rice bubble bars, consumption amongst existing customers is increased. You only have to look at the prevalence of this tactic on packaging to realize its viability, with even Wheatbix using the method. The alternative to increasing the frequency of sales is to increase the volume of sales. For online focused retailers in the food space, this is particularly true. As increasing the volume results in greater profit margin as well as total customer revenue. This works because of the current Australia post pricing scheme. As it streamlines its parcel pricing into thresholds that are determined either by volume or weight. This nonlinear approach to pricing means that packaging costs may be identical when you ship twice the number of products. This is a particularly true in the gourmet alcohol market. Bring these insights back to social media management, we can leverage them to create an effective strategy. A strategy that helps to increase sales and support your business’s objectives. Reach and educate customers, in turn, creating an awareness and need for your product. The 2nd ongoing theme, which has the view to ultimately increase the sales volume is to educate customers on how to use your product and to encourage greater buy frequency. While at the same time communicating the value of your product and differentiating it to avoid substitution. Delivering compelling content that delivers value to the consumer. The price barrier for most food products is going to be minimal. While we know that regardless of whether a customer chooses to shop online or instore that the buying cycle can be compressed into a matter of days. While through the use of coupons we can not only diversify the content that we post but we can also leverage the extra reach that we are able to achieve by differentiating our posts in the eyes Facebook’s and others’ feed algorithms. When considering the above, it’s important to consider your wider marketing strategy, and how social media can contribute to sustainable growth and customer retention. As it enables any business to consistently reach their target audience, in turn creating familiarity. When this is combined with goal-focused content and a quality product it can create habitability. Ultimately, what your business posts and when should be determined by understanding your customer’s buying cycle and how your content can contribute to a favorable decision at each stage of the cycle. While also maintaining agility to monitor and adjust your content to either better persuade people to buy your product or to consume your product at greater volume. In other words, ask yourself when you write something, is this post helping to increase sales or increase the frequency of purchase? While also remembering that sales are a natural consequence of providing value. This means that if you can persuade somebody that they need or want your food, they will purchase it, this comes organically. So pitch the value of your product, be relatable and engaging, and grow & sustain customer awareness of your product. Originally published on the 23rd of May 2017, updated October 28 2017.